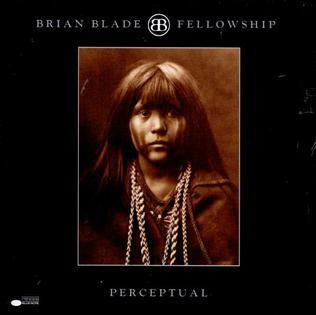 Brian Blade Fellowship released its self-titled debut album in 1998 — one year after Blade, a drummer with a beautiful touch and an elastic sense of time, first formed the band. From the start, it had a sound remarkable for its soft glow and insinuative forward pull, along with a harmonic signature informed by the Southern gospel and folk music of Blade's upbringing. By the time the Fellowship made a second album, Perceptual, it was no longer a revelation to hear this cauldron of sounds. But Blade and his pianist-coproducer, Jon Cowherd, had forged an ever-stronger bond, figuring out what worked best within their style. The signature of The Pat Metheny Group is obvious, framed more or less as an homage, but there was so much else in this music besides — notably a forthright commitment to deep melody and a graceful play of tension and release. Blade had only played drums on the first album; here he also provides some vocals and acoustic guitar. The other guitarists on the album are Kurt Rosenwinkel (acoustic and electric), Dave Easley (pedal steel) and yes, Daniel Lanois (all of the above). Joni Mitchell even lends a guest vocal on one track. But if you want sense of what made Perceptual so powerful then, and so enduring today, try "Evinrude-Fifty (Trembling)," the album's second track. Beginning in an expectant hum, it opens up to an imploring melody, carried aloft by Rosenwinkel and alto saxophonist Myron Walden. Then comes a dark, bluesy riff and a chorus like the skyward release of a pack of doves, as Walden harmonizes with tenor saxophonist Melvin Butler. There's more: a crisp piano solo by Cowherd, a wicked pedal steel turn by Easley. Pure bliss. Buy Perceptual at Amazon or stream it on Spotify.